We do things like plan on cold main courses that can be cooked in the morning before the heat sets in. We do a lot of outdoor cooking and we make side dishes that require very little heat. If one lives in Europe, the chicken broth for this Couscous Salad can be heated in about 90 seconds in an electric kettle. I used green and purple basil. Total time: 15 minutes . When broth is boiling pour over couscous, cover and let stand for 10 minutes… Do not stir it. 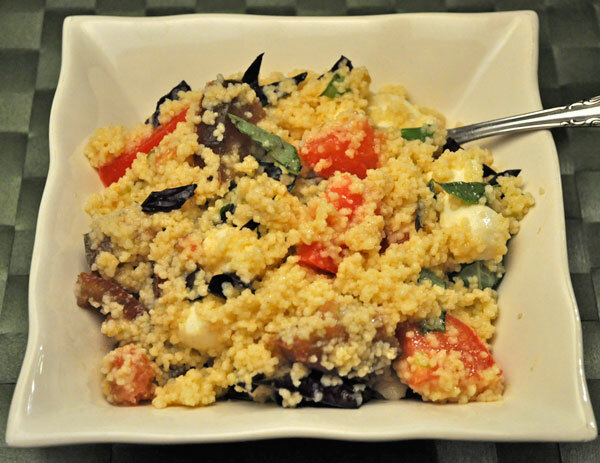 When couscous is done, add tomatoes, mozzarella, basil and fluff gently with a fork to combine. Put the vinegar, mustard and oil in a small bowl. Whisk well and stir into couscous. Serve. We also do things like rub doggie bellies and paws with cool, wet towels and have all playtime in the shade. The good thing is our pool is finally finished and full of water. The bad thing is this heat wave is supposed to last well into next week. YAY for the pool!! Pictures?? Pictures in the camera – coming soon lol Couscous is not the most flavorful thing in the world (like rice or pasta, I guess) but it is easy and lends itself to salads and such. I used to fill a large children’s molded plastic wading pool for my dogs when it got hot. Our old dog used to love to play with the hose and lay under the sprinkler (we’d turn it on just for her). These are such scaredy dogs they wouldn’t do any of that. I have no idea why they are such wimps…. I’m heading out of town tomorrow and really wasn’t in the mode to cook. Came across this recipe and surprisingly I had all the ingredients down to the mini mozzarella balls. Perfect summer dish! For the left overs tonight I have some Persian cucumbers, herbed feta and Greek olives I can change it up with. Maybe a little fresh mint. 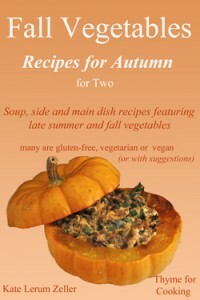 What a great and versatile recipe! The dressing is spot on! Thank you from saving me from a fast food lunch and dinner. Glad to be of help! And I love the cucumber, feta, and mint idea. Greek olives go in most salads at our house. Must put cucumbers on my shopping list. Sadly, I can’t grow them here. I’ve tried and they are always bitter.